I know I’m the classic cliché of the countless foreigners who have walked this way ahead of me, but my stomach is objecting and a lethargic weariness is taking over that has nothing to do with sleep or rest. I feel that I am getting close to the point when all the images I have collected in my head will have to spill out. But I’m holding on. In this country awash in misery and hope, I have questioned why it is that the plight of animals bothers me so. Why do the plaintive cries of the tiny cat we’ve been feeding, whose four kittens disappeared after only 2 days (dogs or rats? ), rip at my heart? My first tears fell after unwinding a terrified puppy from a wire fence. He was tied with a short strip of rag to a big wooden frame to keep him from escaping its yard. When he tried to climb through the fence, he got himself hopelessly tangled and was choking. Rhonda, bless her, in her wonderful wise way, knew what would help..she took me on a hike to the top of the mountain. When I felt mired, she fed my spirit. She showed me the beauty. But later, I had to ask myself, why was it this that broke me, in the midst of all that is Haiti? These boys were hoping to sell a puppy to a 'blan' (foreigner). The best I can come up with at this early date, is that the human tragedy is simply too complex and enormous for me to dwell upon. If I allow it space, I fear it might overwhelm me. But the feelings of compassion, of helplessness, are still there, so I direct them at something manageable. Something familiar. Or maybe it’s like a release valve. 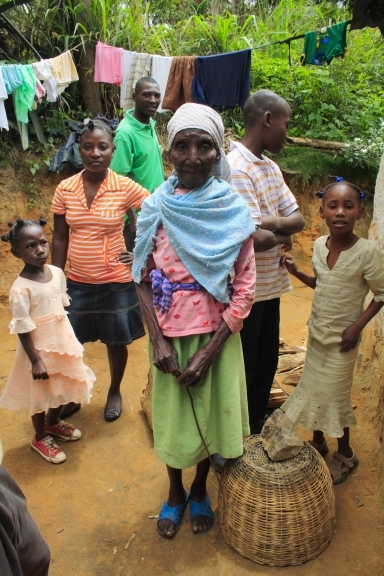 Enabling me to continue looking the Haitian people in the eye…enabling me to see the ways in which they try to survive each day, and admire their strength and dignity and resilience. When I see that they can still dream, I am able to skim past the destitute and the dreary surroundings, watching for the smile lifted from a frown when eyes meet eyes. In the midst of all this, I see You. Isn’t it the strength of human spirit that compels us to seek the beauty? Isn’t this the pure evidence of our humanity? To strain our eyes, to peer into the gloom in order to find a glimmer of light? Any light? I watch, day after day, as the young and old write carefully in their notebooks, then spill out words that are so simple and beautiful that they simply make my heart leap. People have said, ‘This is such a gift”, but I think it is more accurate to call it an unveiling. As they have pointed out, “It is us doing the work. You are making us reflect.” Through their work, they have experienced the empowerment that sharing our thoughts and stories can bring. For now I’m just holding on. Wow! You started something new! I’m so proud of you. I love the way you write, too. Thanks for sharing the journey with us. I purposely did not come to your site until I knew you were home. Having read through your generous sharing I thank you, Deborah. I want to encourage you to take time with God. Take time to write stories to yourself and to Him. Interestingly Deborah, I seem to be at the same place…although I’ve never looked into the eyes I know how I would feel if I were there and believe that it would break me. I have a hard time coping with it all as it is. I forcefully remind myself of the goodness of the world after I watch and read things such as yours…it’s the only way I survive. I just want to fix it all. One can’t even fix one’s own life at times…let alone someone else…. I appreciate your thoughts, Francine – and this seem to be one of our biggest problems, isn’t it? Unfortunately, for too long, our North American solution has been to march in and ‘fix’ their problems, which as you point out, is ironic as we cannot even fix our own. The result is that by doing so, we take away their power to create their own solutions that work for them. Which steals their dignity.